People should stay away from romaine lettuce until U.S. and Canadian health officials get to the bottom of an outbreak of E.coli infections, Consumer Reports says. “Because we have not identified a source of the infections, CDC is unable to recommend whether U.S. residents should avoid a particular food. Thorough cooking usually kills foodborne bacteria such as E.coli or salmonella, but lettuce is not usually cooked. “Even though we can’t say with 100 percent certainty that romaine lettuce is the cause of the E.coli outbreak in the U.S., a greater degree of caution is appropriate given that romaine lettuce is almost always consumed raw,” said James Roger, food safety director at Consumer Reports. 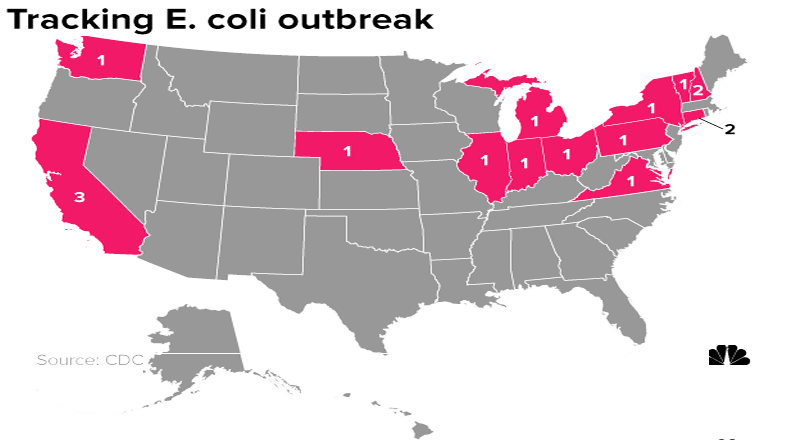 The infections have occurred in California, Connecticut, Illinois, Indiana, Michigan, Nebraska, New Hampshire, New York, Ohio, Pennsylvania, Virginia, Vermont and Washington. But the FDA said there just isn’t enough information yet. “Whole genome sequencing is being performed on samples of bacteria making people sick in the United States to give us information about whether these illnesses are related to the illnesses in Canada. Preliminary results show that the type of E.coli making people sick in both countries is closely related genetically, meaning the ill people are more likely to share a common source of infection,” the CDC said. ← Is Spice Rack Staple Turmeric a Health Star?